Controls standard HVAC units. Thermostats are mercury-free and provide pinpoint accuracy and control for ultimate comfort. If you don�t need a programmable thermostat, but desire the features of an electronic over a mechanical thermostat, then this type is the best choice for your home. 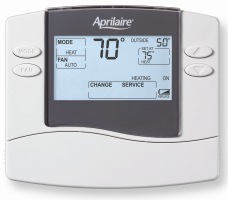 Aprilaire Non-Programmable Thermostats contain compact computers providing outstanding energy efficiency and, depending on which model you choose, can work with single or multi-stage, heat pump and hydronic systems.